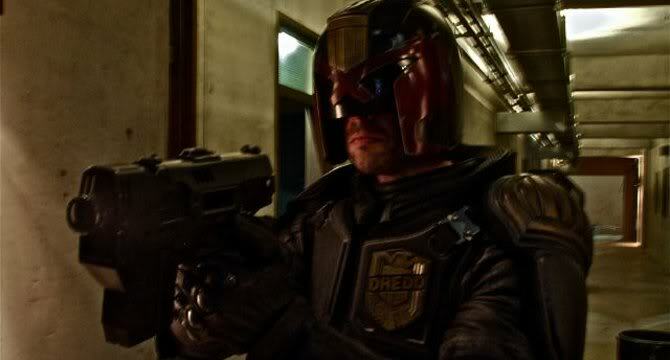 Few more stills from the Judge Dredd film. 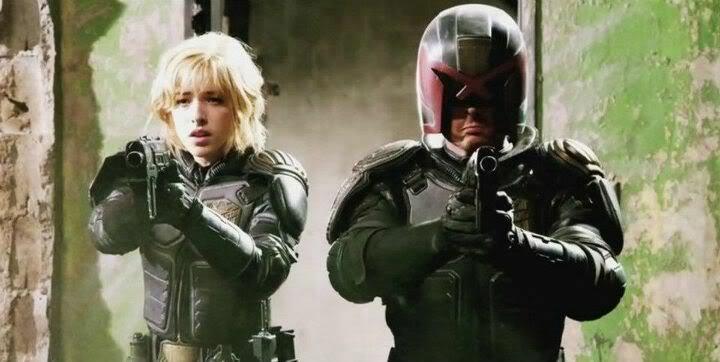 Dredd and I presume Anderson. She better still be a psychic! Still hate the unifroms-without the big shoulder pad and the eagle on the other shoulder the helmet looks too big. And this one is a little violent, hence the spoiler. So I'm guessing its not going to be a Judge Death story then. 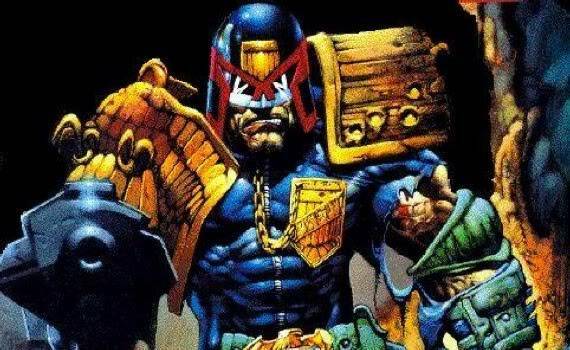 On the plus side Dredd's original artist and co-creator, Carlos Ezquerra, and the other half of the original partenrship John Wagner both have writing credits, with themain screenplay duties going to Alex Garland who you may know as the author of the book The Beach (later a film with DeCaprio) and for the screenplay to 28 Days Later (although I wasn't too keen on that one). 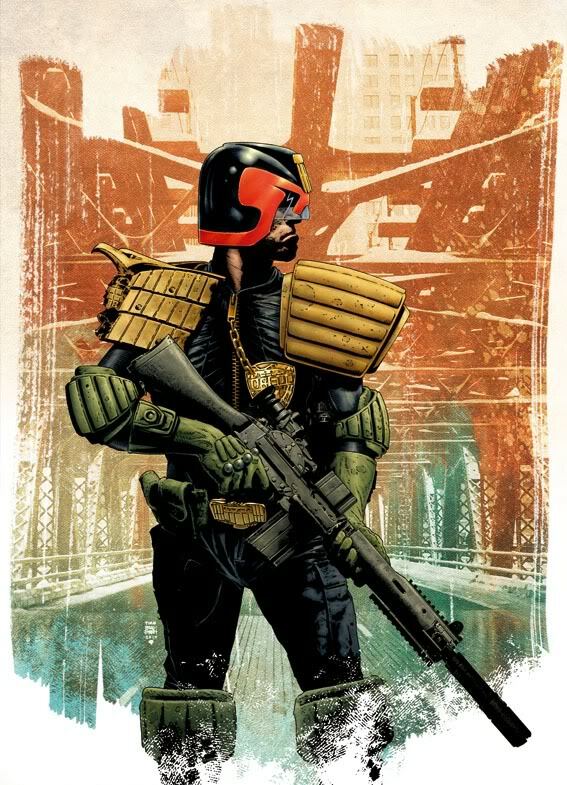 And for reference here's how Dredd should look- the uniform is iconic why change it!!! Is there a reason why Anderson looks stoned in both of those stills? Also, I wonder if the eagle was removed to try to de-Americanize the character (who if I recall correctly is a deconstruction of sorts of overaggressive Americans). The recent GI Joe movies have been similarily de-Americanized, except I'm pretty sure those never had any sense of parody or self-awareness about their excess of Americanisms in the original. But movie producers have been trying harder to appeal to non-American markets since Hollywood blockbusters make increasing amounts of their money overseas. The whole pointo fDedd is its a satire of US culture and beliefs taken to an extreme- a slogan like -The Price of Freedom is Democracy- only has its power if its Americas slogan. The comics dont hide in anyway it being set in America. I highly recommend a read of the story America for example which I think I put on the comics thread noone ever bothered with. But the uniform, the judge silhoutte - it screams Judge Dedd- to remove it seems really stupid. Maybe Anderson looks stoned casue she is a psychic! Or maybe in thoese scens she has been dozed withthe drug the film is about. I recall taking a look at some of the stuff you posted and it looked interesting, but I don't read many comics in general so I never went out and found it. I might some day. It does seem quite interesting and I'm sure the satires it makes of American culture are well-founded. It would take a brave and distinctive filmmaker to preserve that level of criticism in a movie though, and I don't really expect the satire to transfer to the screen version. Hunted down the comic thread- the very first post is the opening two pages ot the story America- give it a read- take you about a minute! I think I recall seeing those extracts. 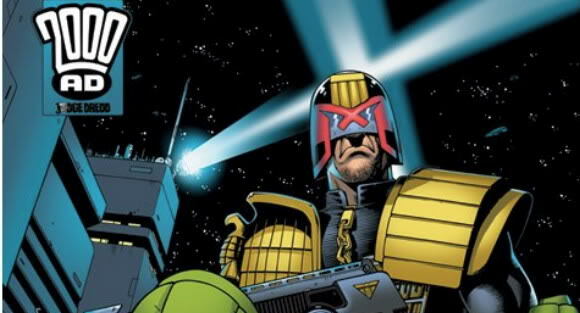 It looks like an idea with a lot of potential and what I've heard about Dredd form you and others makes it sound very, very good. The extract from the Batman/Dredd crossover is worth a read too Eldo as you will be familar with batman at least as a touchstone for it. And its very funny. And Young Death- Boyhood of a Superfiend is a painful but darkly fun read. Sometimes a film comes along, that even if it turns out to be appaling is worth it just for the title. Such is the case here. Oh God, I didn't see a minute of it, the title was enough. I have heard/seen the title somewhere. I have a feeling this is the kind of movie you just HAVE to finish watching to the very end, no matter how bad it is. Nazis ... from the moon! Space shuttles ... with rail guns! Sarah Palin ... as the President! What could go wrong? I'm sure it will be as far from highbrow as you can get, but any film with the tagline MOTHERFUCKING SPACE NAZIS can't be all bad. I really want to see this- apart from anything else I cant think of another Finnish film Ive ever seen and space nazis? Cant go wrong imo. Lol, I think we just might have to see that one! Pettytyrant101 wrote: I really want to see this- apart from anything else I cant think of another Finnish film Ive ever seen and space nazis? Cant go wrong imo. How about zombie nazis in the Norwegian wilderness? Amarië wrote: How about zombie nazis in the Norwegian wilderness? I've heard really good things about Dead Snow before, but now I really want to see it. That looked great! I'm glad to see Space Nazis getting some love too; no one I know IRL was too thrilled by that trailer. Theatrical trailer for Iron Sky- makes me want to see it even more. That's the same one I posted on the last page, Petty. The Berlin Film Festival trailer is worth a look too, if only for the lulz factor in the first half. I just noticed that the spaceship with the rail gun is called the USS George W. Bush. This just keeps getting better and better. I meant to post the Berlin one in that case, and for some reason thought you had posted it originally, as its the one with the tag line you posted in a subsequent post- you confused my poor buckied brain! No worries! I had seen the Berlin trailer (which is where I got the tagline from, obviously) but I thought the theatrical trailer introduced the premise in a bit more detail. Nazi's from outerspace! That's so.... twisted? Iron Sky was featured on the bbc entertainment website yesterday, might have to watch it, I'm partial to sci-fi comedies! Still won't let me put video straight to thread, anyone no why ? chris63 wrote: Still won't let me put video straight to thread, anyone no why ? Yeah, the problem is that you had the bit of "player embed" code in the URL. You have to edit out all the extraneous stuff and just have the URL as "youtube.com/watch?v=XXXXXXXXX" or "youtube.com/v/XXXXXXXXX" without anything extra. I fixed this one for you already, though.